You are here: Home / Blog / Backcountry Film Festival in Bellevue Feb 5! Backcountry Film Festival in Bellevue Feb 5! Get inspired to seek the snow less traveled! The Winter Wildlands Alliance and the Mountaineers Foothills Branch bring you two screenings of the Backcountry Film Festival: Jan. 20 in Seattle and Feb. 5 in Bellevue. 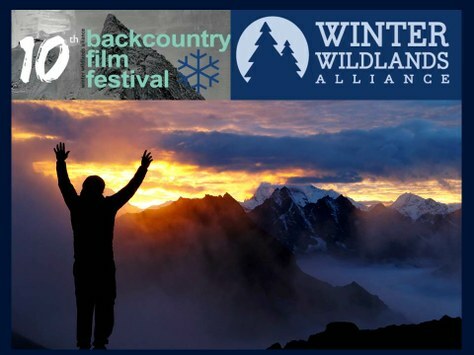 Produced by the Boise-based nonprofit Winter Wildlands Alliance, the Backcountry Film Festival is renowned for its mix of professional and grassroots films, ranging from well-known filmmakers who search backcountry corners across the globe to submit their best work, to first-timers who take a video camera out on their weekend excursions. The festival was created in 2004 to highlight Winter Wildlands Alliance’s efforts to preserve and promote winter landscapes for human-powered users. From a single showing in Boise that first year, the festival has grown to include showings in locations throughout the United States and Canada and now in Antarctica, Europe, Australia and Asia. Funds raised stay in local communities to support like-minded, human-powered recreation and conservation efforts and to raise awareness of winter management issues, avalanche training/safety and winter education programs. Tuesday, January 20th in Seattle, WA at The Mountaineers Seattle Program Center; 7700 Sand Point Way NE, Seattle, WA 98115. Thursday, February 5th in Bellevue, WA at the Highland Community Center; 14224 Bel-Red Rd, Bellevue, 98007. Winner, Best of Festival, Out on a Limb from T-bar Films tells the story of Vasu, who’s love for skiing and the backcountry overcomes all obstacles. Best of the Backcountry Award winner, Powder Pilgrimage from Joey Howell, chronicles the ventures of two friends ski-bumming it to Valdez, Alaska, a trip we should all take once. Best Grassroots Film winner, Backcountry Baker by Jeremy Lurgio follows Labrador retriever Baker and his owner as they pursue their love of mountains through backcountry skiing. From the Road by Fischer Creative portrays the balance between liberation and limitation as a group of athletes come together to help a skiing comrade gain reconciliation with the Alaska peak where a 2009 accident ended his professional guiding career. Afterglow from Sweetgrass Productions is a revolutionary and visually spectacular film that brings a whole new light to skiing in the dark. 95 to Infinity by Doglotion Media follows brothers Andy and Mike Traslin as they keep the torch lit for 95 months of winter turns. Sundog from SturgeFilms capture the dog days of skiing in Patagonia. Higher continues the journey of athlete Jeremy Jones as he reaches new heights. From Teton Gravity Research. Advance ticket purchase is recommended! Find more information on the Backcountry Film Festival here.